So I challenge everyone who reads this to acknowledge those whispers, and the hairs that raise on the back of your neck. That’s your ancestors pleading with you to remember them, and call their name. Raymond Neal circa 1952, Milwaukee, Wisconsin. (My uncle Delmar hiding in the background). When I first began searching for my family’s owner I was focused on Thales Neal’s family. 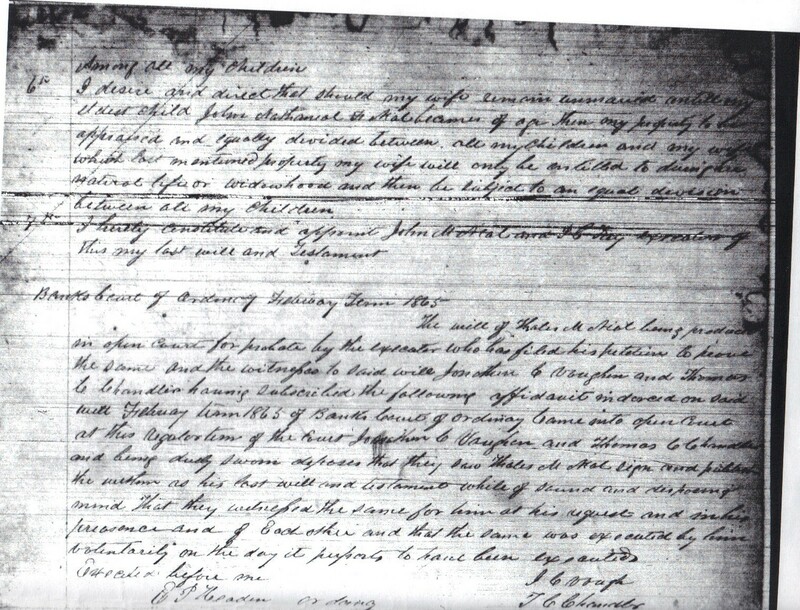 However, I was frustrated when I couldn’t find any documents related to Thales or his father John Mayfield that proved they were my family’s owners. What I realized is that I needed to widen my scope when researching this family, not just focusing on the last one before slavery ended. I believe my ancestors sent a sign that I was looking in the wrong direction. I subscribe to a few different forums on African American genealogy on Facebook. One day I happened to open my page and it automatically opened to the “Our Black Ancestry” forum. There was a post from a woman who had just started researching her African ancestry after discovering her 3rd great grandfather was a free person of color. 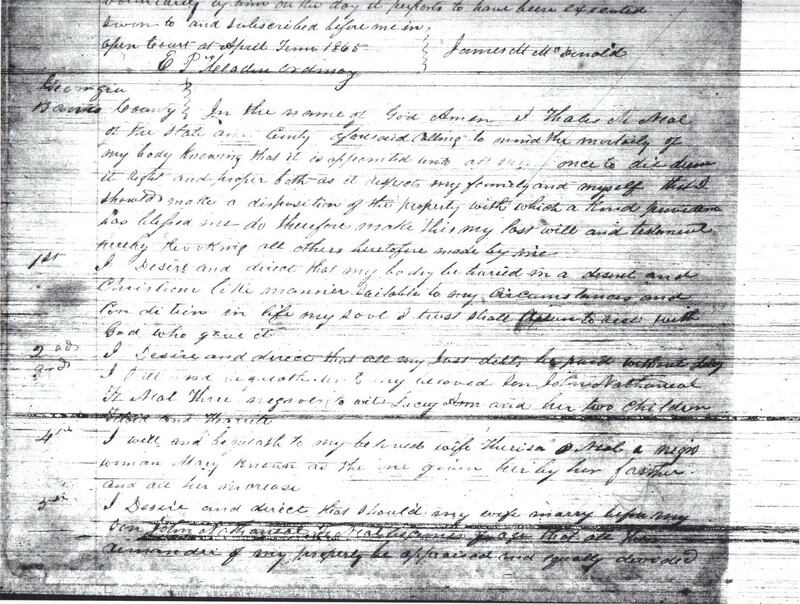 She had been working with a lot of probate records and wanted to know if there was a place to record the names of slaves that she was finding among the records. I wanted to respond to thank her because I know how valuable that information is to those researching African ancestry, and there are quite a few that I have encountered who were not so friendly and forthcoming. 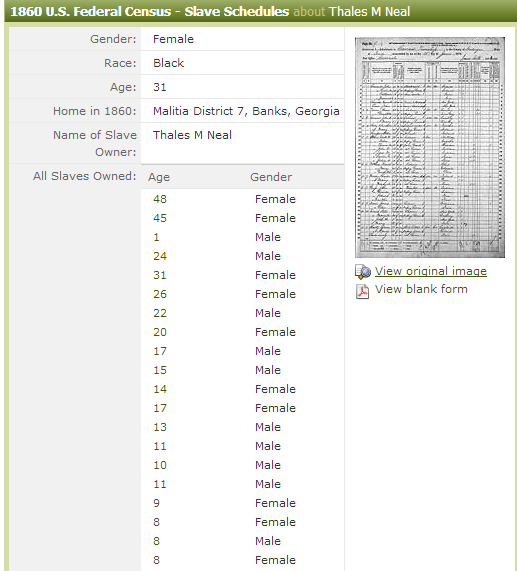 As I scrolled through the many other responses and questions under her post I stopped dead at the last one that read “Yesterday I was researching my Neal side in Franklin County, GA and came across probate that had like 10 or 15 slaves names listed.” I couldn’t compose myself quickly enough to form a reply because I knew that was MY family she was talking about! We exchanged information back and forth just to make sure, and she gave me a copy of the estate file that she had been looking in. It was for William Neal, who died in Franklin County in 1835. On the jacket of the file is a list of negroes: Terrell, Mahely (1844), Berry (12), Silvy (1842), Nancy (50), Reuben (28), Patience (27), Mary (19), Gabriel (12), Queen (8), Lewis (6), Sarah. 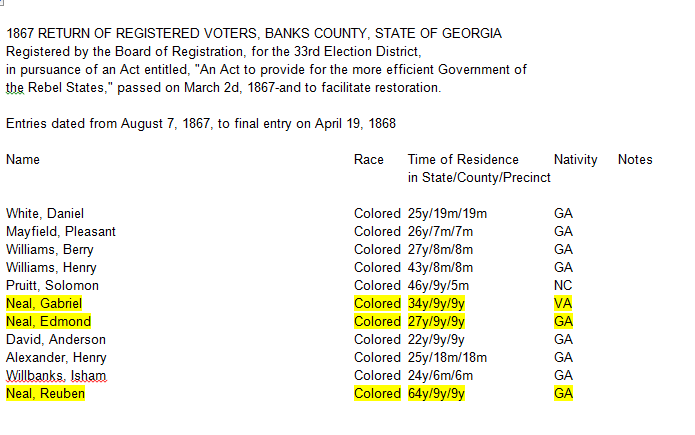 In honor of my 3rd great grandfather, Gabriel Neal, a former slave who is listed in the Banks County, Georgia 1867 Return of Registered Voters. 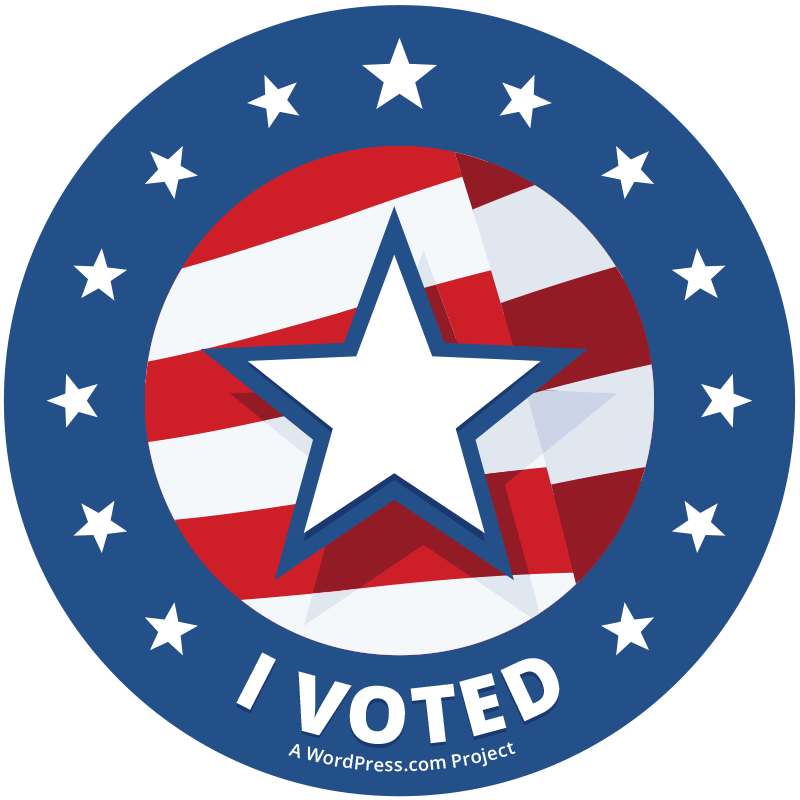 For you, and all of my ancestors who couldn’t, I will honor your sacrifice by making sure our voice is heard. As I am working on this month’s post for Breast Cancer Awareness Month, I received wonderful and unexpected news from a friend and fellow genealogy blogger. 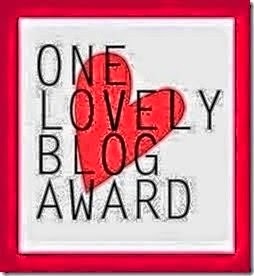 Denise Muhammad, author of They Came From Virginia, nominated me for the One Lovely Blog Award. I visit Denise’s blog often, her style of writing is engaging and her stories always inspire me to go back and check a few more sources for my own research. Best of all, she shares some fantastic pictures with her posts! 5. I volunteer as a breast cancer advocate, and have lobbied in Washington D.C.
For those on my list, if you have already been nominated I’m pretty certain that you don’t have to nominate a group. This list could be much longer, as I had a hard time narrowing it down to 15. There are so many bloggers that I follow that inspire me, and I hope that they will continue sharing their stories with us in the future. I will be contacting the 15 bloggers on my list, unless they see this post and contact me first. Thanks again to Denise for the nomination. I feel very proud to be included in your list of lovely blogs! I have always been a strong proponent for knowing your family health history. Genealogists should be aware of the advantage of using genetics to not only make a familial connection, but also uncover possible links to hereditary diseases and ailments. Consequently, my focus for September is National Sickle Cell Awareness Month because of my own health history. As a carrier of the trait, which is usually asymptomatic, I was one of the few that had milder symptoms of the disease. As a child I remember suffering painful episodes that were attributed to “growing pains”. Only now do I realize that these were not in my head, and I have had bouts of anemia through my adult life. Although there are very few who know about the disease, there are approximately 100,000 people suffering with the condition in the United States alone. 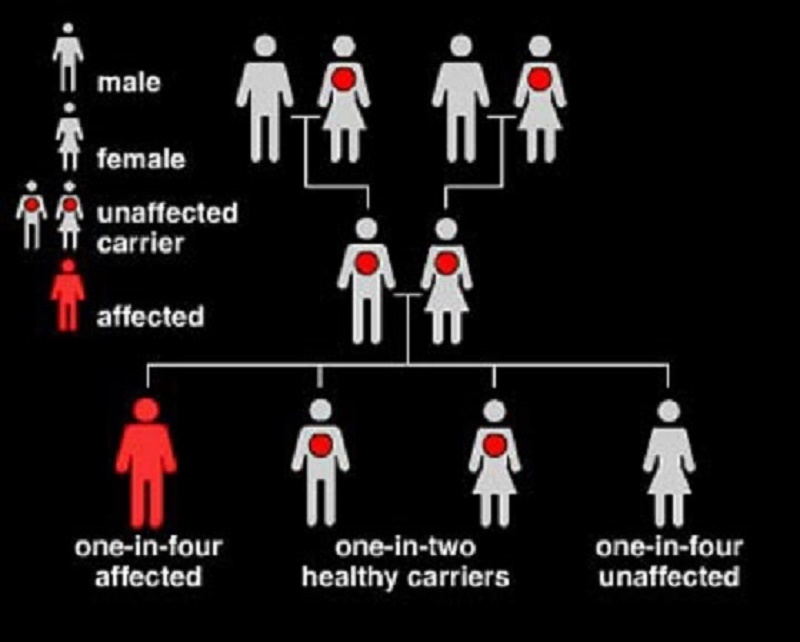 Sickle cell disease (SCD) is a genetically inherited blood disorder. There are several different forms of SCD, and the most common and usually the most severe form is sickle cell anemia. My father was aware that he carried the sickle cell trait, and he was adamant that I be tested for it as an infant. I knew since I was younger what that meant, but by the time I was old enough to have children of my own I forgot about the potential to pass the disease to my own children. “The sickle cell gene is passed from generation to generation in a pattern of inheritance called autosomal recessive inheritance. This means that both the mother and the father must pass on the defective form of the gene for a child to be affected” (Causes, 2014). That being said, my father had to inherit the trait from one of his parents, and so on. I happen to know that it was my paternal grandmother, so it was passed to her from one of her parents, but I don’t know which one. In a case where I was uncertain of parentage the condition would be able to help me narrow down my list. Unfortunately, many of the death certificates that I research do not list sickle cell as a contributing factor as a cause of death, and in the example of my paternal family, many of them died from heart disease. I wonder if I would be able to determine if death was a result of end organ disease and undiagnosed SCD or a predisposition to heart disease? There are many clues in my genealogical research that force me to pay attention to my own health, specifically when I see the diseases and conditions my ancestors suffered from. The study of genetic genealogy allows me to take my research one step beyond what I see in records. However, the standard DNA tests that are available today for genealogy do not test the markers that show genetic diseases. I believe it is just as important for genealogists to leave a legacy of medical information for their descendants because knowing this history can save their life. Therefore, in my own family pedigree charts I always include the cause of death along with other vital information, which also makes it easier for me to create a chart to show patterns of ailments and diseases. There are also web-based tools for those who feel comfortable storing this information online. The Surgeon General’s Family History Initiative was created to encourage all American families to learn more about their family health history. “My Family Health Portrait Tool” can be found online at https://familyhistory.hhs.gov/fhh-web/home.action. Today, not only do we understand that such uncommon diseases as sickle cell are hereditary, but that even common ailments such as diabetes, many cancers, and heart disease may also have a genetic link. Making a pedigree chart, taking the simple blood tests, and registering for the marrow donor lists can make a difference in your own family health history, as well as those who are affected with similar conditions. It could mean alleviating unnecessary pain and suffering, or possibly life and death. Next month I will continue in the series of genetic genealogy for Breast Cancer Awareness Month. “Currently the National Institutes of Health (NIH), through its Human Genome Project, is mapping the 100,000 genes in the human cell. We now know, for instance, that a woman with a certain damaged gene, BRCA1, has a 90% chance of getting breast cancer during her lifetime. If a search through your family tree shows a high incidence of breast cancer, then this gene may be lurking in your pedigree” (NGS, para. 7, 2013). What is sickle cell disease? (2014). Retrieved September 2014, from http://www.wepsicklecell.org/about/. 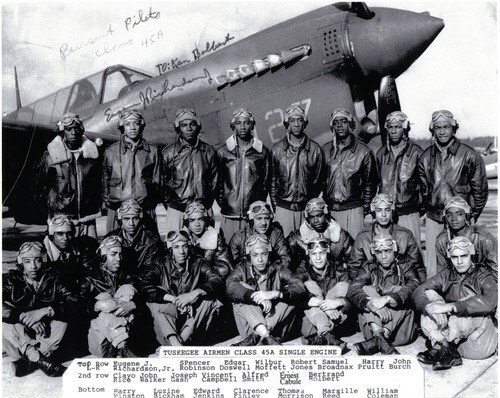 The 99th Pursuit Squadron, later dubbed the Tuskegee Airmen, was activated in March of 1941. In honor of this important anniversary I was drawn back to my own research and I found a possible connection to the prestigious airmen in my paternal Holbert line. Of course, with every new discovery there are always more mysteries that come along to challenge your findings. Much of my research of the Holbert family reveals a long line of educators, and that tradition continued in the line of my 2nd great grand uncle, Benjamin D. Holbert. 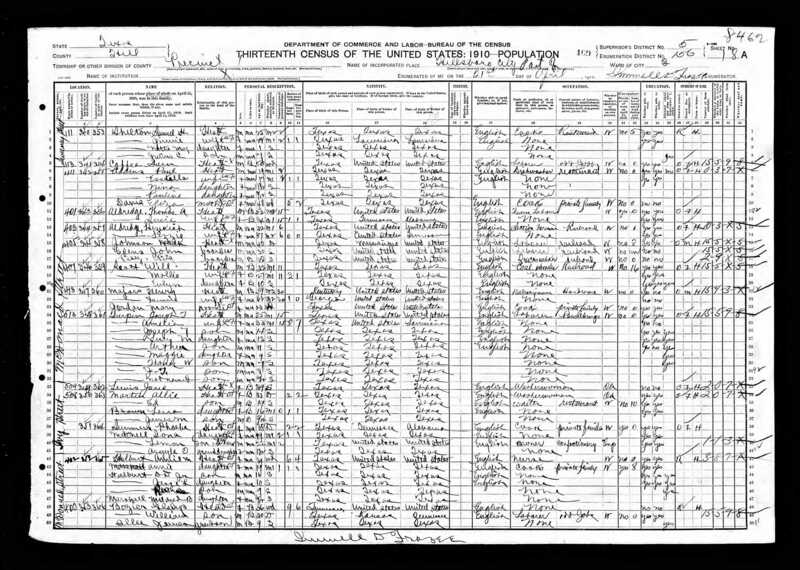 On the census records from 1870 and 1880 he is listed as the son of Franklin and Susan Holbert, living in Cherokee, Texas. In 1890 I found a city directory from Waco, Texas that lists a Benjamin D. Holbert as a colored teacher. The only record I found for anyone matching his birth date in 1900 was in the U.S. Jail in Muscogee, Oklahoma, Indian Territory. It states he was born in Texas and both of his parents were born in Alabama, which matches my uncle, but it lists his occupation as “physician”. This census also states Benjamin has been married for 13 years. Although I don’t find any more records for him after 1900, there is a marriage record for a B.D. Halbert and Annie Marie Estell in nearby Mclennan, Texas dated December 29, 1886 (14 years from that 1900 census). Coincidence? Ann Marie Estell was born in Waco, Texas around 1868. I do not find her on a 1900 census, but I do have a city directory from as early as 1902 that puts her in Waco, Texas. In 1910 she is living in Hill County, Texas with four children: Annie, Benjamin Jr, Jessie and Ruth. All of the children’s death certificates confirm their father’s name as B.D. Holbert. The only son, Benjamin Jr., is living with his wife, Sarah, on the 1928 city directory in Dallas, Texas. He is using the initials B.D. Holbert from this point forward. However, on the 1930 census he is now living in Seminole, Oklahoma. He is widowed and is boarding in the household of William and Emma Simmons. His current age, age at first marriage, and his occupation of public school teacher match my ancestor’s information. On the 1940 census he is still in Seminole, Oklahoma but is now married again and a principal in the public schools. Was that an error to list him as widower on the last census? If so, why was he living apart from his family? 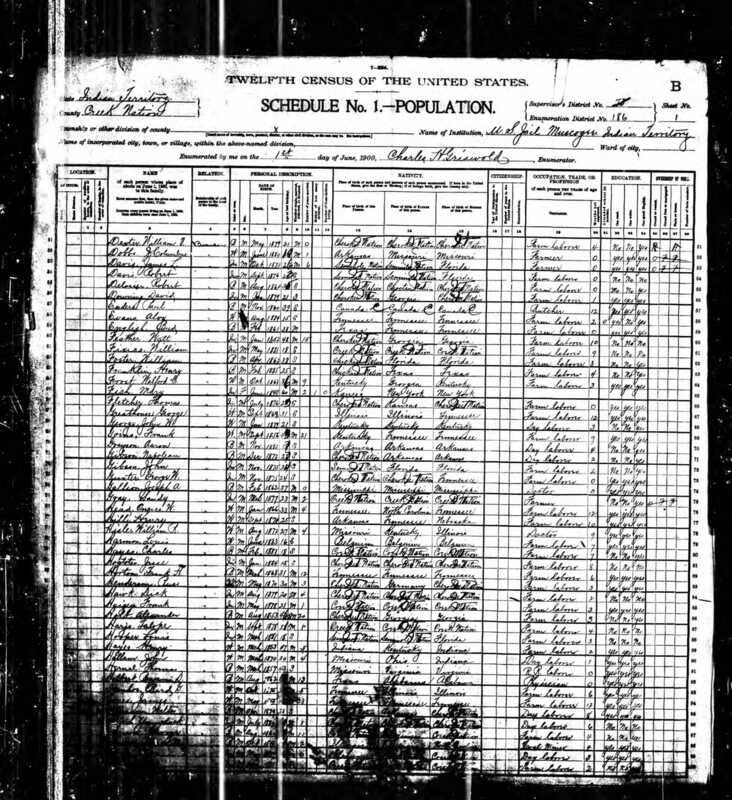 Sarah Cummings Holbert is still living in Dallas, Texas with her two children, Bertrand and Kenneth, on the 1930 census. She also states that she is widowed. According to her death certificate she had remarried and was now Sarah Sears. I have not yet been able to find her or her children on the 1940 census, but I do know that she was also a public school teacher. It is Benjamin and Sarah’s son Bertrand Holbert who was a member of the Tuskegee Airmen Class 45A Single Engine Pursuit Pilots. I don’t have the proof I would need to make this a positive match even though there are relatives who have listed them in their family tree. I have so many ancestors named Benjamin, B.D., and Annie to keep them all straight. I need to order the death certificates of all the names that I don’t have already, and hopefully they will clear up some of the confusion. Class 45A, fighter pilot (single-engine) group graduation class photo, with P-40 plane in background (courtesy of Sam Broadnax). That would be my cousin Bertrand Holbert, 2nd row, last one on the right. I had a discussion with other African American genealogists about using Ancestry family trees. My opinion was that I hoped that more subscribers would make their trees public instead of private. The connections that I’ve made from researching public trees has been invaluable, and one in particular stands out in my mind. 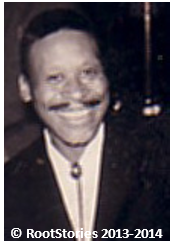 My final tribute during Black History Month is a salute to my first cousin Robert Lee Neal (1917-1987). Photo courtesy of C.H. Neal, ©RootStories, All Rights Reserved. My grandfather’s sister told me many stories about their father Roy Neal, and even though I have no pictures of him I wanted to find any of his nine sisters and brothers. While researching the family trees on Ancestry I happened to find a connection with one of the brothers, William Neal. This was a rare occasion because most of the trees are private and don’t allow me to make sure I have a positive match. I emailed the owner and he wrote back explaining that indeed, his great uncle was the same William Neal! I was so excited to share information with him that we emailed back and forth for days, sending pictures and sharing more stories of the other side of our families. I could never find such personal information from a book or online, so to me it was more valuable than any other resource. Another local artist who worked with one of the WPA’s most famous artists and a well-known African American Dayton painter. Neal did not live in Dayton when he was involved with the WPA. A native of Atlanta, he started painting under the guidance of the famous African American muralist Hale Woodruff. “He began his studies when he was 15, and his lessons cost 50 cents a day,” said Neal’s widow, Alberta Smith Neal. “When he was about 18, Mr. Woodruff wanted him to enter a big show, but Bob didn’t have the right clothes and couldn’t afford to attend the opening. Mr. Woodruff rented him a limousine and a tuxedo so he could go, and Bob ended up taking first place in the show-his painting was judge to be better than his teacher’s (Woodruff)”. 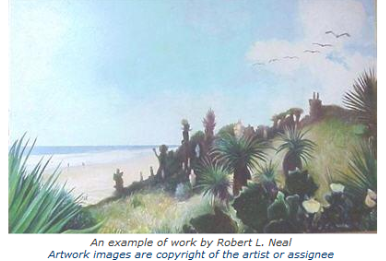 Neal moved to Dayton in the early 1940’s, after the WPA program had ended, but many local artists recall his stories of Woodruff and his own work with the WPA murals. “Bob was Woodruff’s understudy for the Amistad murals at Talledega College in Alabama,” said Michael Sampson, local artist and coordinator for public communication at the National Afro-American Museum and Cultural Center at Wilberforce University. The murals were painted in 1939, just before Neal came to Dayton, and Sampson has a copy of a letter written by Woodruff to his biographers that clearly establishes that “Bob actually did the cartoons (under drawings) for the murals, and he posed for all the hand drawings and some of the figures done in the mural.” Photographs of the mural series, titled The Mutiny Aboard the Amistad 1839, were on display in the DAI exhibition, and those who knew Neal could recognize his long expressive hands on the men in the paintings; in addition, many of the figures- and even some of the faces- share the same features of Neal’s self-portraits. In Dayton, Neal continued to paint, and some recall his mural that decorated the Lakeside Grill (now the Crescendo) on Germantown St. The club is still operating, but the mural has been painted over. None of the local WPA artists in this article are with us today, and unfortunately, neither is most of their WPA work. Undoubtedly, not all of the work produced under the auspices of the WPA could be labeled as “great”, but the WPA and the art that it spawned is part of America’s –and Dayton’s- history, and its goal to integrate art into daily life played an important role in our public art legacy. It is ironic that, in just half a century, so much work that was intended to preserve local heritage has been destroyed and forgotten by the “future generations” which it was intended to inspire. Perhaps the most important lesson to be learned from such devastation is that it is imperative to preserve and document public art. After all, it is our public art that, in part, documents and preserves our times, our history, and our heritage.